House Minority Leader Nancy Pelosi talks about immigration, gridlock and why she’s still in the political game. 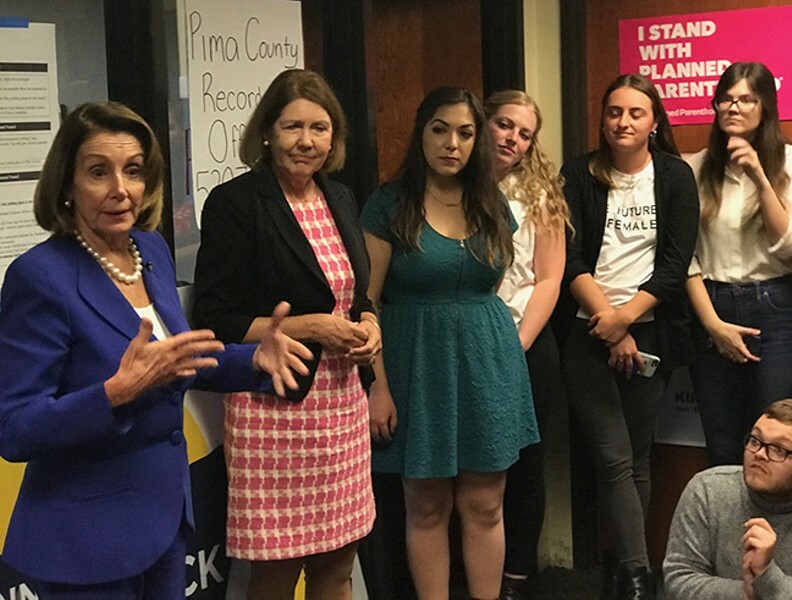 House Minority Leader Nancy Pelosi traveled to Tucson last week to stump on behalf of Democrat Ann Kirkpatrick, the former congresswoman who was facing Republican Lea Marquez Peterson in the race for Southern Arizona's open Congressional District 2 seat. Pelosi praised Kirkpatrick for having the courage to vote for the Affordable Care Act in 2010, despite the political consequences. "We can't wait to have her back," Pelosi said. "She'll be effective right from the start." In her comments, Kirkpatrick praised Pelosi's legislative acumen and said she would support her for Speaker if the Democrats retake the House of Representatives. The Weekly had an exclusive one-on-one interview with Pelosi following her pep talk to Team Kirkpatrick volunteers. The following transcript has been edited for length and clarity. When you're on the outside looking in, it really seems like Republicans and Democrats are at each other's throats these days. From the inside, are relations less tense when you meet with your counterparts from across the aisle? Well, we have personal friendships, that's for sure. Not as many as we would have had before Trump because the Trump phenomenon or whatever you want to call it—they're strictly all the way with Trump. There's nothing that he has been about—name any subject, guns, immigration, women's right to choose, LGBTQ, fairness in our economy, climate. Name a subject. Republicans have been there longer and worse. So, he's their guy. So, they're completely sympatico, and that motivated them to pass a tax bill that has trillions of dollars of impact on our economy. In the dark of night and the speed of light, without any hearings, without listening to what ramifications it could have, by vastly increasing the deficit, robbing from our children's future. That's what he wanted. That's what they got. Rubber stamp. And so, it's hard. But people are people, and we have our relationships regionally from our states or like in the Women's Caucus. It's like a giant kaleidoscope. One day, you and I will be on the same side of the issue. The next day, the two of you will be, and I'll be over here with somebody else, but we're always a resource to each other as we turn that wheel. I work with the Republicans all the time on human rights and religious freedom throughout the world. So, there are some issues that pull us together. Today, we have seemly more tribal politics than we've had in the past. How do Republicans and Democrats find common ground to break through the gridlock that seems to be gripping Washington? I have never really quite understood the tribal thing. We're different political parties. We have different views of government and that been called tribal. I have a couple of answers. The first one is the public. Let's just let the public know what the vote is. Why are you hiding this? Why are you disguising and misrepresenting it? Let the public see what is happening. That's why transparency is so important. So I think, again, as Lincoln said, public sentiment is everything. With it you can accomplish almost anything. So, I think the public visibility helps bring people together. And we could pass a gun-violence prevention bill with the background checks in a bipartisan way right now today. We could pass a bill to protect the Dreamers in a bipartisan way right now today. So, there's some things that we can do together if the leadership of the Republican Party will allow it to happen. And they only allow, I guess, what President Trump wants to happen. I don't know, but I know they are not allowing it to happen. And I do really believe that the president is talking about the press being an enemy of the people and he doesn't want to see a common collective consciousness about things. He wants to put everything in doubt. I think that's very dangerous for a country. But the opposite of that, where people do come together, almost involuntarily, are the arts. I always said the arts will bring us together because you enjoy music, you laugh at something, you cry at something, you're inspired by something. It has nothing to do with politics. It softens the edges of some of the debate. I've never seen anything quite like the President calling the press the enemy of the people, really acting in violation of the system of checks and balances, undermining the Constitution that he took an oath to uphold. Then again, it's not about him. It's about the other members of Congress. Do you think the talk of the caravan is the latest effort to gin up outrage about immigration? It's a scare tactic. Trump knows he's getting clobbered by suburban women. Suburban women care a great deal about security. So, how do they frame the caravan? 900 miles away from here and walking. How many people are going to reach our border? Most of them, if they're economic refugees, they're not going to have any moment. It's only about unfounded fear of persecution that has any chance of having that an asylum claim to refugee status. Even the evangelicals, they testified before our hearings. The United States refugee program is the crown jewel of America's humanitarianism. Evangelicals love Trump because of the court and all that, but not on this subject. What kind of compromise legislation on immigration do you think is possible in the Congress next year? Well, we sit down and negotiate and see. I wouldn't show my bottom line right now. But I do think that we have to listen. Again, Democrats are bipartisan. That's who we are. That's just the way it is. We have confidence in our ideas but the humility to listen. We'll just see. So many times mess ourselves up when we show our bottom line. So many times when you negotiate with him, you say, "Oh, can we yield on that and you yield on this and do that?" And they'll say, "I'm walking away from my side of it," and you're already down the road. You've been at this for a long time. You've certainly heard the calls for new blood in Democratic leadership. Why do you—to coin a phrase—persist? I would not have persisted if Hillary had won. I'm very proprietary about the Affordable Care Act. You may have noticed that. So, I knew it would've been protected with a woman at the table. From the standpoint of policy, I know my stuff. It enables me to be master legislator. I know how to win. I know the politics and part of that is just having a plan, having a vision for our country, having a plan on how to win, and that attracts the resources. So, I'm a dazzling fundraiser. Ever more important these days. Well, I wish it weren't. My goal is to reduce that. It's an organizing tool. And you know, we have to win the White House, to get different judges, to get something done. It's a long road for some of these things, but the time does go by. My motivation is about the people. Everybody has their why. Why do you do this? Well, my husband and I have five kids. So, that's my motivation every day. What are we gonna do for the future? For our children? Whether it's their health, their education, the economic security of their families, clean, safe environment, the air they breathe. But you can't let the opponents choose your leaders. You just can't do that. And you can't, as a woman, turn away from the fight. And you can't, as a woman, let anybody minimize your contribution.